Peter Baron’s SAMAX Motorsport will field two Porsche 997s in the Rolex 24, with interesting line-ups in each car. #17 – Lance David Arnold / Jan Seyffarth / Johnny Mowlem / David Shep / Bryan Sellers. #71 – Dave Lacey / Brent Martini / Greg Wilkins / Mark Wilkins. The #71 entry is a joint Doncaster Racing / SAMAX effort. Lance David Arnold and Jan Seyffarth, both Germans, have been racing for the UPS Porsche Junior Team in the Porsche Carrera Cup in Germany, and in the Porsche Michelin Supercup. Arnold finished fifth in the 2005 standings in Germany and Arnold eighth. Both will reach their twentieth birthdays this summer. Johnny Mowlem and David Shep are rather more experienced – the professional having raced at Daytona six times, the gentleman three. Shep finished third in class last year (with the Lacey / Wilkins / Wilkins group, in a TRG East [Peter Baron] Porsche), while Johnny Mowlem had a disappointing 2005 Rolex 24 (in the Red Bull Porsche) – but has otherwise amassed a sequence of excellent results at the race (including second overall twice). "There were various opportunities, but the only one that made sense was to go back with the team that we had so much success with last year,” said David Shep. “I'm very excited at going back to Daytona to try and win myself another Rolex, especially with such good team-mates,” added Johnny Mowlem. “It has always been a happy hunting ground for me and I'm hoping that 2006 will be no different!" Bryan Sellers put the TRG East Porsche on pole at Homestead early last year, for his first start in a GT car, then spent the season racing for the factory Panoz team in the ALMS. The image shows the #61 SAMAX Porsche on the way to third at Daytona last June, in the Brumos 250. 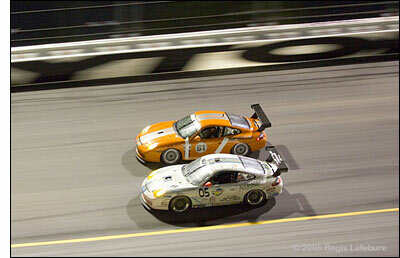 Doncaster Racing achieved notable success at the Rolex 24 in 2004 - a class win in the SGS (now GT) Class. The SAMAX-prepared Doncaster Racing Porsche 997 will be racing in a full season of the Grand Am Rolex GT series this year.